It looks like the head of a camel. The 5,400-metre volcano erupted with a plume of ash after shaking for several minutes early on Friday. 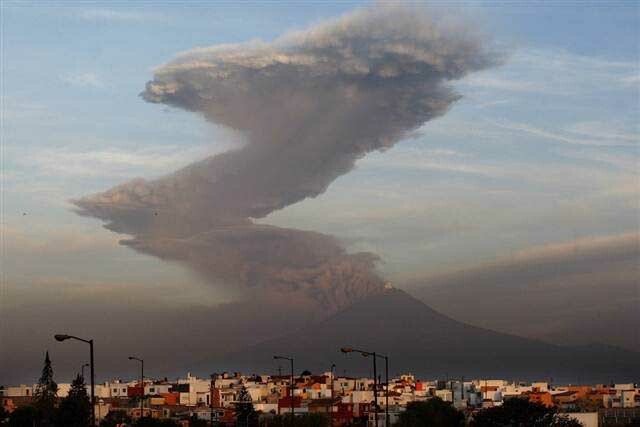 Civil protection authorities reported that the cloud drifted west before turning back eat towards Puebla City. The Popocatepetl volcano that towers over Mexico City began rumbling again Friday, shooting a blast of ash about 2 miles above its crater at dawn. The ash cloud drifted first to the west and then turned back east toward the city of Puebla, Mexico's national disaster prevention agency said. The 17,886-foot mountain shook for several minutes before the ash burst out.